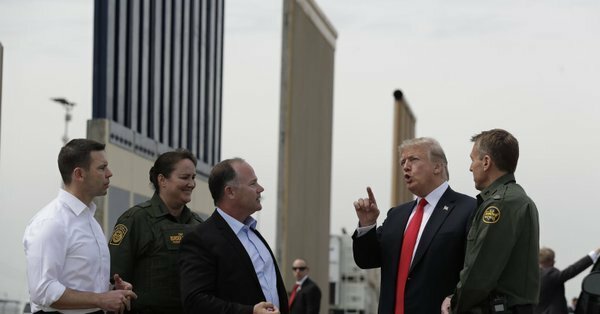 Trump visited the demo of southern wall that he expect to build up between US-Mexico border. VietPress USA (Feb. 5, 2019): During his 2016 presidential campaign, Trump vowed that he will build a wall along southern border between US - Mexico and assured that Mexico will pay for that wall, but Mexico denies to paying it! Trump turned back to ask Congress to accept a fund of US$5.7 Billion for building his wall along the southern border. Trump believes he can get the fund easily, but Democrats control the House and House Speaker Nancy Pelosi declared never approve Trump's requirement. Trump decided to shut down partial federal government during 35 days as longest one of the American history for pressure to Congress on the border wall. Nancy Pelosi asked Trump to stop the shutdown then after one week she will agree to welcome Trump to give his State of the Union at the chamber of the House. Trump finds no way to deny and had to temporary stop the government shutdown for 3 weeks. Nancy Pelosi declared Democrats' winning and today President Donald Trump gave his second State of the Union address with a threat to make another government shutdown due to a partisan impasse over construction of a wall on the U.S. border with Mexico. President Trump delivers the State of the Union address on Tuesday night. It comes at a perilous time in Trump’s presidency, with the threat of another government shutdown looming due to a partisan impasse over construction of a wall on the U.S. border with Mexico. President Trump is delivering his second State of the Union address on Tuesday night. It comes at a perilous time in Trump’s presidency, with the threat of another government shutdown looming due to a partisan impasse over construction of a wall on the U.S. border with Mexico. Yahoo News will have complete live coverage of the address in the player (above) as well as instant analysis in the live blog. Will President Donald Trump declare he's building his border wall without congressional consent? Will he share a chilly moment with House Speaker Nancy Pelosi with the nation watching? Who will make a statement by merely being in the room? Speaker Nancy Pelosi may have bested Trump in the 35-day shutdown fight, which concluded last month with the president reopening the government without receiving any of the funding he had demanded for his proposed border wall. But the president insists he will get the wall one way or another. "I think there's a good chance that we'll have to do that," Trump said, referring to the prospect of declaring a national emergency to bypass Congress to build the wall. He hinted that he may make an announcement on border security in Tuesday night's speech, telling reporters to "listen closely to the State of the Union. I think you'll find it very exciting." But despite the president's teasing words on Friday, multiple people familiar with the most recent draft of the president's speech told ABC News on Tuesday that the president will stop short of declaring a national emergency. The president has also been clear that he is not ruling out the possibility that he would shut down the government again when funding runs out Feb. 15, even though the option seems less politically viable just weeks after the president pulled out of the nation's longest government shutdown with no political victory to show for it. While the main event of any State of the Union is the presidential address, much of the political spectacle has to do with who's in the room. Presidents and first ladies, as well as members of Congress, regularly use the speech as an opportunity to send an unspoken message with the guests they invite. The White House has invited a number of guests to sit with first lady Melania Trump who serve to reinforce a specific aspect of the president's agenda or will help to highlight a moment within the speech. Among the guests as announced by the White House: surviving family members of a person killed by an undocumented immigrant, the first prisoner released because of White House-backed, criminal justice reform legislation passed last year, a woman who has recovered from drug addiction, a government special agent on human trafficking, a person who has benefited from the president's tax bill, and a survivor of the Tree of Life synagogue shooting in Pittsburgh. The list also includes a sixth-grader named Joshua Trump, who the White House says has been bullied because he shares the same last name as the president. Many members of Congress are also bringing along as their invited guests people whose presence sends a message. Democrats are broadly trying to send a message on immigration, with many inviting Dreamers and DACA recipients. And two Democrats are taking former employees of the Trump Organization who were undocumented immigrants at the time of their employment. Rep. Bonnie Watson Coleman, D-N.J., is taking Victorina Morales, and Rep. Jimmy Gomez, D-Calif., is taking Sandra Diaz. Freshman Rep. Alexandria Ocasio-Cortez, D-N.Y., for her part, has announced she will be bringing as her guest a woman who famously confronted then-Sen. Jeff Flake, R-Ariz., in an elevator on Capitol Hill to plead with the senator over his vote for Supreme Court nominee Brett Kavanaugh. I'm proud to announce that my #StateOfTheUnion guest will be @AnaMariaArchil2. On Tuesday night, the president will enter Pelosi's House to deliver his address before a newly divided House chamber now controlled by Democrats. 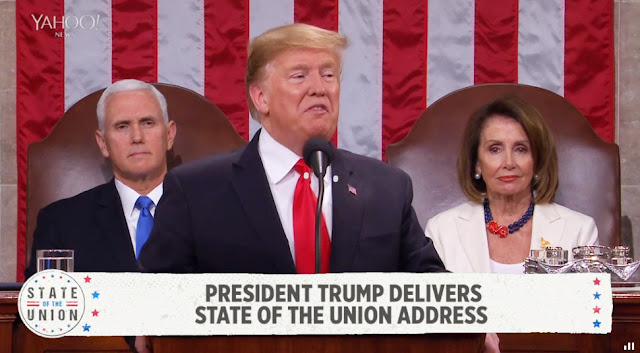 And throughout the speech, Pelosi will be seated just over the president's shoulder -- a constant reminder of the new era in Washington. Speaker Nancy Pelosi and President Trump have not come face-to-face since the height of the government shutdown standoff last month. The interaction and body language between them will be something to watch, as personal relations between the two have grown increasingly chilly, with Trump calling the speaker "very rigid" and "very bad for our country" in an interview with CBS over the weekend. Trump is expected to have his second summit meeting with North Korean dictator Kim Jong Un later this month, but an exact date and location have yet to be announced. In a recent interview with CBS, the president suggested he may reveal those details in his State of the Union address. Trump went on to say that he's "looking forward" to the meeting and that he has "fantastic chemistry" with Kim. And while the president's own intelligence chiefs said in testimony to Congress last week that North Korea is unlikely to part with its nuclear program, Trump maintains "we have a very good chance of making a deal."